In the third week of World Football League action in 1974, the Southern California Sun traveled to Florida to face the Jacksonville Sharks on July 24. Both teams had split their first two contests in the new league’s early going. The Sun were coached by Tom Fears, a Hall of Fame player with the Rams who had been the first head coach of the NFL Saints. They had made preseason headlines by signing highly-touted rookie running backs James McAlister and Kermit Johnson out of UCLA as well as USC tackle Booker Brown. There was a good mix of veteran and new talent on the team. QB Tony Adams (pictured above), who had failed to catch on with the NFL Chargers the previous year, had proven veteran WR Dave Williams to throw to and Brown was joined on the offensive line by 13-year veteran OT Joe Carollo. After losing a close contest to Birmingham in their opening game, the Sun had won a shootout over The Hawaiians. Jacksonville hired an ex-high school coach, Bud Asher, to direct the club but had plenty of players with NFL experience. 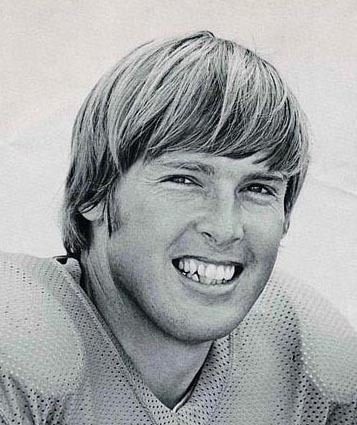 QB Kay Stephenson was a backup with the Chargers and Bills. RB Tommy Durrance, a local college star out of Florida, led the running attack. The defensive line was anchored by seasoned veterans in DE Ike Lassiter and DT Bob Taterak. The club had won its opening nationally-televised game against the New York Stars but lost on a last-second field goal to the Chicago Fire the next week. There was a big crowd of 46,780 in attendance at the Gator Bowl for the Wednesday night contest (although the number that had actually paid to attend was reportedly at least 15,000 less). Southern California had difficulty mounting an offensive threat in the first half as Tony Adams faced significant pressure from Jacksonville’s tough defensive line, tossing two interceptions, and McAlister and Johnson were held to just two rushing yards. Additionally, punter Steve Schroder bobbled two snaps and WR Terry Lindsey fumbled a punt return. The explosion and fire on a cargo ship on the nearby St. John’s River created far more excitement than the visiting team’s offense. The Sharks used four Grant Guthrie field goals to take a 12-0 lead – the first, from 23 yards, provided the only points in the first quarter and the other three came from 29, 27, and 42 yards. Still, after dominating the first half, the home team had yet to penetrate the end zone and the visitors were still within striking distance. Tony Adams and the Sun offense came alive in the third quarter and drives of 44 and 62 yards put them ahead by 15-12. The first ended with Adams throwing to Dave Williams for a 20-yard TD, but the action point attempt, a running play, failed (in the WFL, touchdowns counted for seven points and were followed by an action point, which could not be kicked). The second came on a one-yard run by RB Ralph Nelson and Adams threw to James McAlister to add the action point. An eight-play, 68-yard series put the Sharks back in front on the first play of the fourth quarter. Kay Stephenson threw to WR Tony Lomax for a 16-yard touchdown. The pass for the action point was unsuccessful but the home team was ahead by 19-15. Twice the Sharks stopped Southern California drives in the final period and, buoyed by the enthusiastic crowd, appeared to be in command. With 2 ½ minutes remaining, the Sun got the ball back and mounted a drive from their own 20. Short passes to McAlister and Williams moved the ball to midfield. On a fourth-and-six play Adams completed a pass to Kermit Johnson to the Jacksonville 40 for a first down but with only seven seconds left on the clock. Following a timeout, and with the crowd in a frenzy, Adams threw deep into the end zone from 40 yards out and Williams made a leaping catch for a touchdown. Williams, a seven-year NFL veteran, made use of his four-inch height advantage to out-leap 5’10” Jacksonville CB Jerry Davis. The action point attempt failed, but it didn’t matter as the Sun came away with a stunning 22-19 win. The Sharks outgained the Sun (271 yards to 258) although the visitors had the edge in first downs (17 to 16). However, Jacksonville also turned the ball over three times, to two by the Sun. Despite a rough start, Tony Adams completed 18 of 31 passes for 214 yards and two touchdowns as well as two interceptions. Kermit Johnson rushed for 88 yards on 15 carries while James McAlister, who ran for 18 yards on 6 attempts, led the club with 9 pass receptions for 74 yards. Dave Williams (pictured below) had 5 catches for 99 yards and the two TDs. For the Sharks, Kay Stephenson was successful on 12 of 21 throws for 127 yards and a touchdown with one picked off. Tommy Durrance ran for 73 yards on 22 carries and RB Ricky Lake added another 60 yards on 9 attempts. WR Drew Buie topped the team’s receivers with four receptions for 51 yards. “We just threw up a prayer and hoped someone would answer,” said Dave Williams of the climactic touchdown play. It was the second straight game in which the Sharks had lost on the last play of the game and Coach Asher could only shake his head afterward and say “I can’t tell you how much this hurts – losing two in a row like that.” They lost again the next week and then scandal would hit the team – and the whole league – when it was revealed that robust attendance figures were inflated by the handing out of free tickets. Asher lasted six weeks before being fired and the financially troubled club failed to last the full season, ending up with a 4-10 record. The Sun also had financial problems but completed the schedule, topping the Western Division with a 13-7 tally and reaching the playoffs. They lost dismally to The Hawaiians in the first round, however, after the star rookies McAlister, Johnson, and Brown chose to sit out the contest due to a missed payroll. 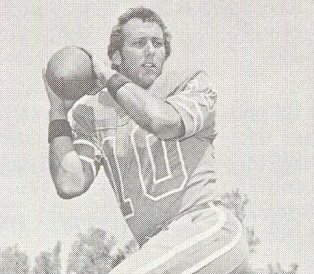 Tony Adams ended up being one of the WFL’s three Co-MVPs as he led the league in passing yards (3905). Dave Williams caught 59 passes for a team-leading 979 yards (16.6 avg.) and 11 TDs. Grant Guthrie went to the Birmingham Americans, who won the league title, after the Sharks folded and received All-League honors from both the WFL and The Sporting News. A veteran of two NFL seasons with the Buffalo Bills, his 18 field goals topped the WFL.